Alex Vann, Pete Judge and Paul Bradley set to do the first Kelston Records gig. 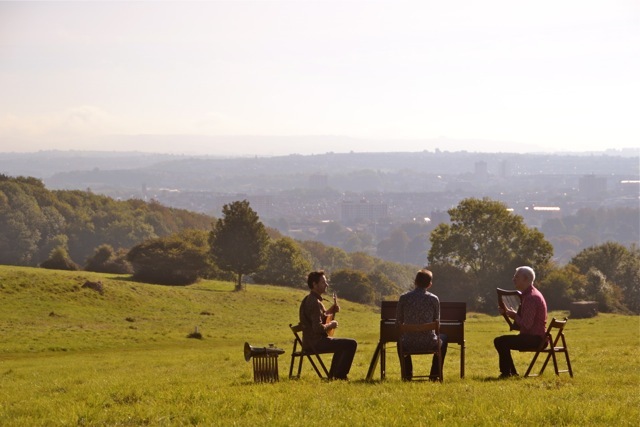 Three Cane Whale play the Old Barn, Kelston Roundhill on Thursday 7 July 2016. The live gig will be recorded for Kelston Records, working with Bath Spa University. UPDATE: #KelstonLaureate Jon Hamp will introduce the band live with new work in a rare public performance. You can join us that evening for a short walk up Kelston Roundhill, some poetry, an optional meal and refreshments, and the live recording of the performance. by multi-instrumentalists Alex Vann, Pete Judge and Paul Bradley. Three Cane Whale’s music regularly draws on a love of places and locations. For their second CD the band recorded every track in a different non-studio environment. They band has a broad appeal from Radio 3 across to 6 Music type audiences. Their music rewards a little thoughtful concentration, and should be ideally suited to the “Live at the Old Barn” format. Come and share an evening with them as they connect with and reflect the spirit of Kelston Roundhill. Tickets are now on sale online. Email kelstonrecords@gmail.com if you want to be kept in touch about this and future events.